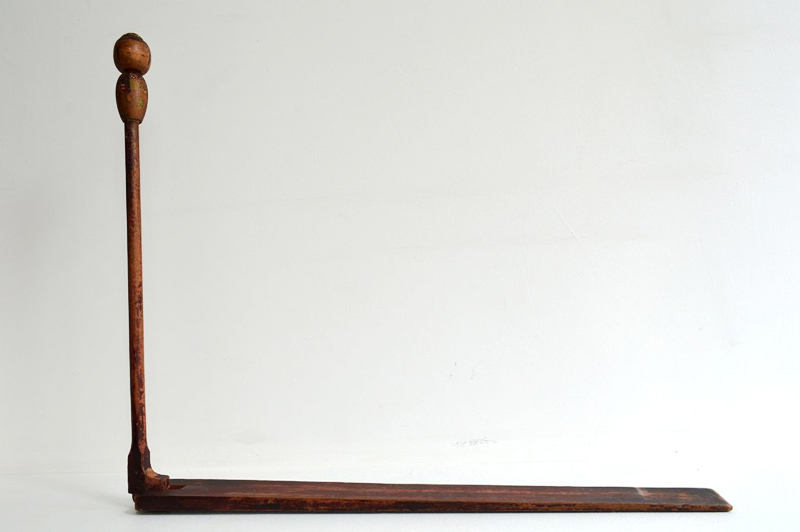 KUKEDAI WITH KOKESHI (Dealer: titcoRet) – ‘Kukedai’ as a Japanese sewing stand (tool) for blind-stitching when tailoring kimono, composed of wooden board and prop with a pincushion as usually. But, unusually attached with kokeshi doll with pincushion head at the tip of prop as it’s quite a unique and lovely type for use of child. Showa period, mid 20th century. Carved sign of its former owner’s name at backside. Damage at pincushion head as seen, and loose L-shaped joint as is.